San Francisco's gay outdoor vacation destination. You can kick back and enjoy the peaceful serenity of Nature while you’re at The River, but the music will lure you eventually to the poolside parties that go all day until the sun goes down. There is something going on every night. Try a party at Liquid Sky, live entertainment at Main Street Station, or Karaoke at Russian River Resort. 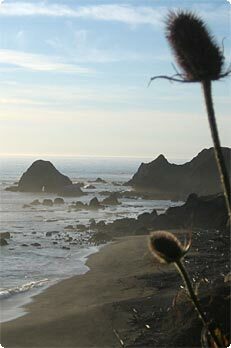 Visit the Sonoma Coast, meet new people at the hang out spots, go wine tasting, visit Armstrong Redwoods, be inspired by the grandness of nature. Ideal growing conditions and many tourism services make the Russian River wine region a renowned destination for visitors and wine growers alike. View the best of Russian River wine country. Categories include best winery tour, best wine tasting room in town, best wine tasting room at a winery, best organic wine, and many others. May - Hot Pool Parties, Bumpin' Night Life, Dancing, Craft Fair, Dining, Motorcycle Run, Auction, Live Music, Camping, Shows, Contests, Seminars. And... women, Women, WOMEN!! The River is just a short drive north of San Francisco. Looking north of the River's mouth at dusk. The fog is beginning to build on the water. Just out of view to the left the sun sets the horizon ablaze across the shimmering ocean surface. Main Street Guerneville. 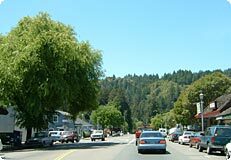 Guerneville is the center of gay life on the River, home to the resorts, bars and gay owned businesses. Guerneville is a hate free community. Golf package. Golf under ancient redwoods at Northwood Golf Club. Learn more. Book two nights and get the third night free. Winter prices from $55/night. Learn more. Copyright © 2005 Cielo Projects Publishing. All rights reserved.